Driving in a car has so many sensory limitations. 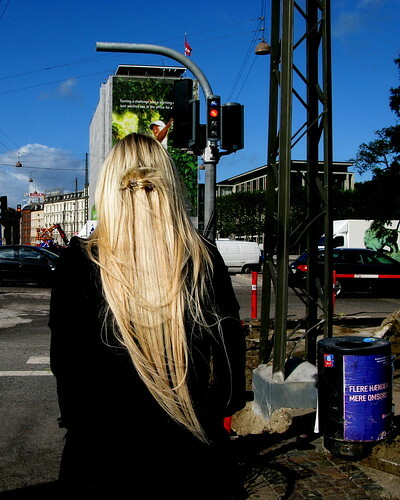 You never get to regard peoples' hair at a stop light. You don't get to experience the scent of peoples' shampoo, perfume or cologne at a red light or as they pass you on the bike lanes. 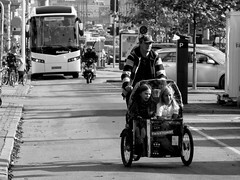 You never hear fingers drumming gently on handlebars as the cyclist next to you enjoys a song on their mp3 player. You don't get to smell the aroma of freshly brewed coffee to go. You miss out on overhearing the passionate discussions of children as they flow through the city. You can't hear the crunch of teeth on a fresh, autumn apple. "Copenhagen loves you. And your bike. But mostly you on your bike."
. . . but I bet not as much as I love the sentiments in this post! A real 'take time to stop & smell the roses' end to Saturday. Thanks for sharing. 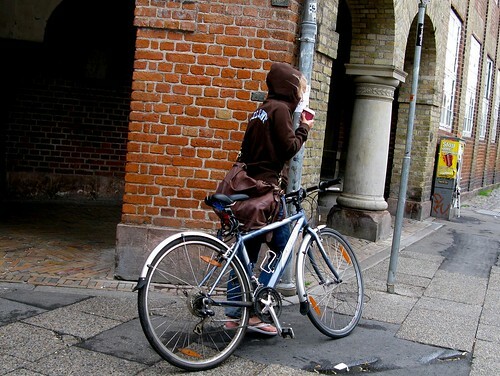 WHY CAN'T BIRMINGHAM BE LIKE COPENHAGEN?! IT'S JUST NOT FAIR!!! Nope! Only on a bike you can do all this. 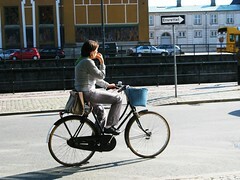 thanks for posting some 'eating drinking smoking on a bike' pics! And you don't get to smell the small of freshly baked bread wafting out of a window when you pass a bakery on your way home at 5 in the morning. oooh, yes. fresh bread. nice one.